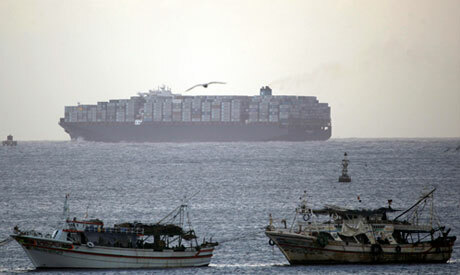 Egypt's President Abdel Fattah El-Sisi directed officials to exert utmost efforts to increase the rates of the ships transiting the Suez Canal with the aim of boosting foreign currency revenues, urging a flexible marketing policy in dealing with the shipping lines. This came during a meeting with President Sisi held with Chairman of the Suez Canal Authority (SCA) and the Suez Canal Economic Zone (SCEZone) Mohab Mamish. The president ordered facilitating work of investors operating in the SCZone and removing obstacles that face investment. He directed officials to develop the infrastructure and accelerate finalizing the industrial zones that are currently under implementation so as to include all kinds of facilities and services. El-Sisi praised efforts and dedication of people working at the Suez Canal Authority and Economic Zone. During the meeting, Mamish reviewed the latest developments regarding the flow of work at the Suez Canal Authority and work progress of development projects at the SCZone and seaports, in addition to the project of upgrading Lake Manzala. Mamish also highlighted the growing interest of the world major companies in investing in the SCZone. He asserted that the authority’s policy depends on offering incentives and removing all obstacles that may face investors as well as focusing on the industries that provide job opportunities and contribute to achieving the State’s comprehensive development objectives.